While putting together the "Who's In, Who's Out" list for local Congressional candidates (don't worry, no one else read it, either), we read through the bio for Mike Rocque. 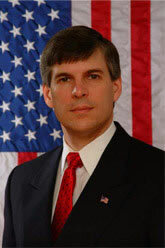 He's one of the Republicans running for the nomination to take on Kirsten Gillibrand in the 20th district. You gotta read this bio -- it's like the CV for a superhero or Jack Bauer. From 1980 through 2000 Michael distinguished himself as an officer in the United States Army, where he earned the rank of Lt. Colonel. He served first as a member of the Green Berets and then as a member of the Delta Force, the highest priority combat unit in the U.S. Military. As a Commander of a Special Operations Squadron in the Delta Force he was responsible for training, equipping, deploying and leading his squadron anywhere in the world immediately upon notification from the President of the United States and the Secretary of Defense. So, what's Rocque doing now? According to the bio, "senior management executive." No wonder he wants to run for Congress. The description totally makes us think of that job Mr. Incredible had at the insurance company. Fine print: just to make sure we're all on the same page, this item doesn't imply an endorsement of Rocque or any other candidate. I will stick with Gilibrand..